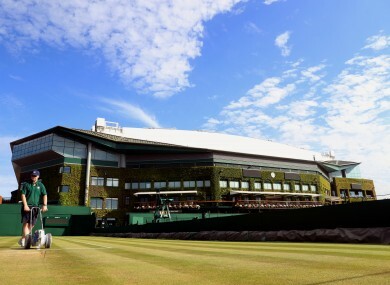 Some players have raised concerns over the playing surfaces at SW19. Temperatures have soared in London over the last few days. WIMBLEDON OFFICIALS DISMISSED growing concerns over the state of the All England Club courts on Friday despite some surfaces already stripped bare of grass after just four days of the Grand Slam event. The tournament’s Court 18, where John Isner and Nicolas Mahut famously played out their three-day match in 2010, has come in for the fiercest criticism. On Court 17, meanwhile on Thursday, American star Bethanie Mattek-Sands suffered an horrific right knee injury after her leg buckled. It was not clear, however, whether the state of the surface was a contributing factor in the 32-year-old’s accident. “The court preparation has been to exactly the same meticulous standard as in previous years,” said the All England Club. However, French 12th seed Kristina Mladenovic said there was a hole on Court 18 and that she and opponent Alison Riske had wanted to stop playing. “The colour of the court, the fact that there’s no more grass, the fact that the baseline where we are running, it’s very slippery. There’s no grass,” said Mladenovic, who was beaten in three sets. Swiss 19th seed Timea Bacsinszky had similar complaints after beating Olympic champion Monica Puig on the same court on Tuesday — just the second day of the two-week long event. “I’m pretty disappointed about the quality of the grass, especially on Court 18, I’m not saying it’s dangerous, but it was the second day of the tournament, and it was already ruined,” said Bacsinszky. “Sorry, Wimbledon, it’s not against you, but there are improvements to do on this thing. Seven-time champion Roger Federer said that if both players complained about the state of a court then their concerns should be taken seriously. “It’s been extremely hot. You should always take the players’ opinion serious, especially when both say it,” said the Swiss. The players found support from retired stars including Pam Shriver, who won five women’s doubles titles at Wimbledon in the 1980s. “The footing on grass when I played was good unless wet, but now they are rolling it so plays like a hard court, the footing will be worse,” the American tweeted. French 21st seed Caroline Garcia, who downed Madison Brengle on Court 18 on Friday, said the surface played differently depending on the time of day. “My previous match I played over there on the fourth match, and I thought the court was very bad for second round. Today at 11:30 was okay,” Garcia said after making the third round. “It can be slippery, but you have to be careful. It’s still grass. I think every single court of grass court is difficult. Wimbledon courts are no stranger to injury controversies. In 2013, Victoria Azarenka fell heavily, hurting her ankle and blamed the state of the courts. At the same event, Maria Sharapova said the surface on Court Two where she lost to Michelle Larcher de Brito was “dangerous” after she fell a number of times. Email “Grounds for concern? Wimbledon officials dismiss court fears after player complaints”. Feedback on “Grounds for concern? Wimbledon officials dismiss court fears after player complaints”.